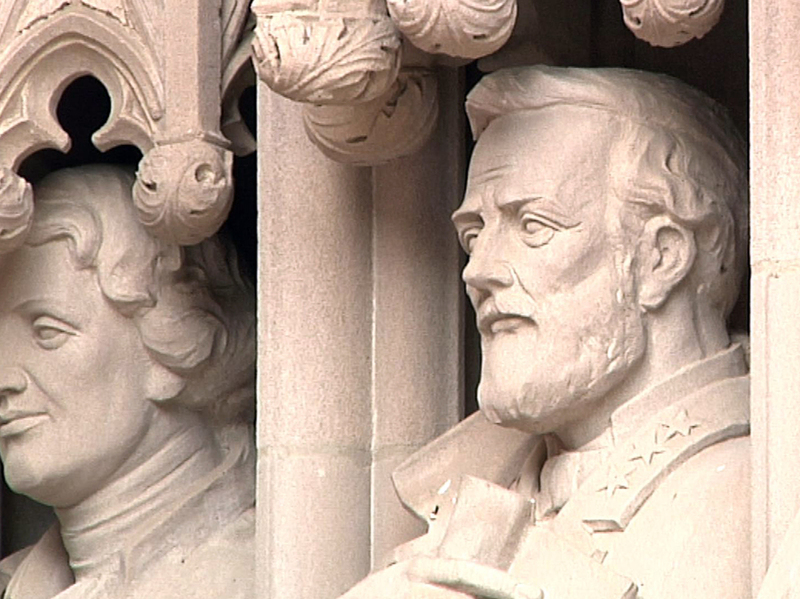 Duke University Removes Robert E. Lee Statue From Chapel Entrance : The Two-Way The university president said he had ordered the statue removed as a safety measure and to reflect the "abiding values" of the school, following vandalism earlier this week. A photo of the statue taken in months before it was damaged and then removed, shows Confederate Gen. Robert E. Lee at the entrance to Duke Chapel in Durham, N.C.
A statue of Confederate Gen. Robert E. Lee was removed from the entrance to Duke University Chapel early Saturday by order of the university president who said in a letter that the move was not only a safety measure but also meant to express the "abiding values" of the school. The decision to remove the statue from the Durham, N.C., campus, comes after it was defaced on Wednesday and follows violent clashes last week in Charlottesville, Va., between right-wing extremists and counterprotesters over plans to remove another statue of Lee. "I took this course of action to protect Duke Chapel, to ensure the vital safety of students and community members who worship there, and above all to express the deep and abiding values of our university," university President Vincent Price wrote in a letter to the campus community. "The removal also presents an opportunity for us to learn and heal," he said, adding, "We have a responsibility to come together as a community to determine how we can respond to this unrest in a way that demonstrates our firm commitment to justice, not discrimination; to civil protest, not violence; to authentic dialogue, not rhetoric; and to empathy, not hatred." He said that the statue "will be preserved so that students can study Duke's complex past and take part in a more inclusive future." Separately, a statue honoring pro-slavery secessionists outside the old Durham County courthouse was pulled down by protesters on Monday. "Hundreds marched on Friday through downtown Durham in a largely peaceful demonstration against racism, leading to an impromptu rally at the site where the bronze statue was toppled. "Other monuments around the state have been vandalized since the Charlottesville protest. There have also been calls to take down a Confederate soldier statue from the campus of the University of North Carolina in Chapel Hill."